It is time for Akufo Addo to realize that he is the president and must show leadership. He and Bawumia still act as though they are in opposition. The achievements that Bawumia intentionally projected at the town hall talk show are the controversial over priced contracts which were awarded to their family and friends. All the selected so called achievements which were touted by Bawumia to the staged excitement of the rented audience do not have any bearing on the living standards of Ghanaians. It rather worsens the dwindling condition of the citizenry. 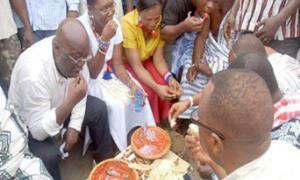 Indeed the poor standard of living of Ghanaians will continue to expose the vile propaganda of Akufo Addo. We all recall that Akufo Addo used every foul and unfair strategies to manifest his father’s dream. Although he has been preparing himself for the whole of his life to become a president, his performance so far indicates that he is the worse president ever to rule Ghana by all standards. He has collapsed all traditional pillars of democratic structure that have been established over the years. Instead, he is systematically replacing such structures with his own conception. This is what dictators and fascists do. For example, after he was exposed at the AWW bye-election to the horror of the international community, as a result of creating a parallel militia to replace the traditional security services, he is trying very hard to distance himself from his own militia, a typical tyrannical attitude. Ghanaians should be aware that as Akufo Addo consolidates power, he will proceed to use worse methods unknown in politics to establish his own type of hegemony to perpetuate his rule in a very subtle way. He has plan A to Z towards achievement of his political agenda. It's all for the akyim ruling clan, making all other Ghanaians as their subjects to serve them.